I’ve been doing a bunch of soul searching as of late. I woke up recently and looked around only to realize how much has changed for me this last year. The scenery is the same, the people are the same but so many things seem so different. I realized it was me that was different. Last May, I met a beautiful lady at DFWCon; a writing conference we both attended. Her name is Kimmie Easley and she published a book shortly after the conference titled, Souls Set Free; which can be purchased here. I don’t know why it took so long to read her book but I am glad I finally did because Emma’s plight resonated deeply with me. 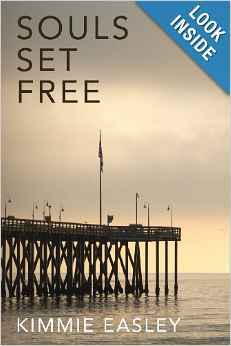 Souls Set Free is about a woman, Emma Carter who had almost given up on her life. She was blind to the blessings surrounding her and it took some pretty special timing to bring her back to life. This story is about a woman who had done her best to avoid any kind of soul searching because of the emotional pain it invited, but because of a phone call announcing that her mother had been murdered she was forced to relive and confront the past that was stealing her future. There is so much honest emotion packed into this well written book. I have to be honest, I found myself putting the book down in many spots just to cry. I found much of myself in Emma; a character who at her core was fighting her demons to find healing. I would highly recommend this book if for no other reason than to see what a healing spirit looks like. Wonderful review, I think I’ll go look this up as it seems like something I would enjoy. It is odd how one day we can wake up and look around or react to something and realise WOW I’ve changed so much – I’d have never felt that way in the past. I think it is an excellent experience although a bit daunting at times. Hi, Jenni! I would love to hear your thoughts. I hope you find it a journey well worth the time. Thanks! I’ll most definitely be checking out this book thanks to your recommendation! Hope you find it an inspiring journey, Fearless Red!